If you have hearing loss, getting fitted with hearing aids can greatly enhance your ability to fully interact with the environment and people around you. Once you’ve been wearing them for a while, you’ll never want to go anywhere without them. That’s why, when your hearing aid stops working well or working altogether, it’s important to get them fixed as quickly as possible. Although taking good preventative care of your hearing aid is important, you can’t always prevent hearing aids from malfunctioning, so here’s what to do when it happens. You may not be an expert at how your hearing aids work, but as a regular user, you can check a few basic things before escalating the issue to an audiologist. If your hearing aid isn’t working at all, check the battery. Quite often, you’ll simply need to change it, make sure the contacts are clean and connecting well, and that the battery door completely closes. Secondly, check the controls. It’s possible your hearing aid is switched to the wrong program, has the volume turned down or has a jammed button. If your hearing aid is working, but creating static or cutting out a lot, make sure it’s clean. Ear wax can interfere with the transfer of sound from your hearing aid’s receiver to your ear canal, so get out your tools and make sure the tubing and microphone guard are clear. If your hearing aid still isn’t working after trying these things, it may need a more thorough cleaning or repair. Don’t attempt to fix it yourself – call a professional. Audiologists are doctors or hearing, but they’re also familiar with how hearing aids work and even how styles and manufacturer models differ from one another. If you’re on vacation when your hearing aid acts up, a local audiologist should still be able to help you. Based on your description of the problem, an audiologist may give you more specific troubleshooting advice over the phone or ask you to come into the office for a closer look. 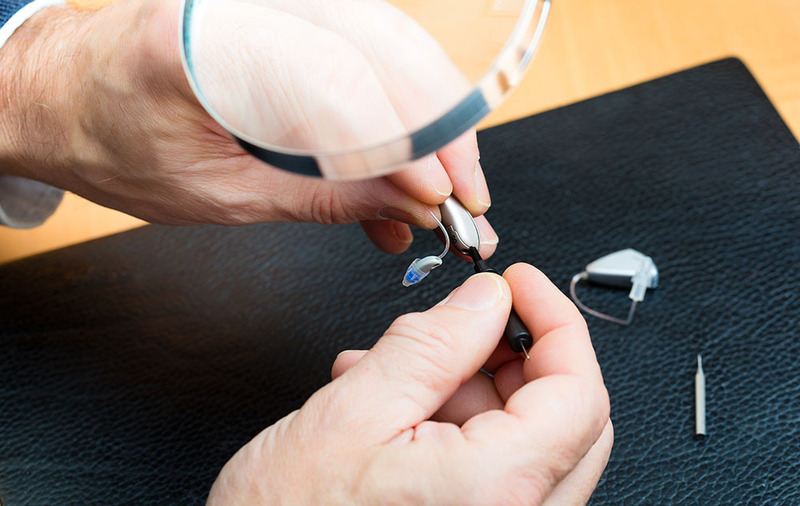 Deep cleaning and minor repairs can often be completed in the clinic while you wait, but if the hearing aid needs more serious repairs, it will be sent out to the manufacturer for repair under your warranty. Sometimes you’ll be able to fix your own hearing aid and other times you’ll need to take it in. Regardless of your hearing aid repair situation, an audiologist is the best resource for professional help and fast follow-up so you’ll be wearing your hearing aids again as soon as possible.